Sadly, summer is over, and it’s time to get our fall crafts going! October is one of those reasons people live in Michigan, as it is so incredibly gorgeous here. Leaves are changing colors, the air is crisp, apples and pumpkins are in abundance, and football season has officially begun. What’s not to love? Fall is also the perfect time that we get into craft mode, and begin preparing for the holidays that consume us until year end. 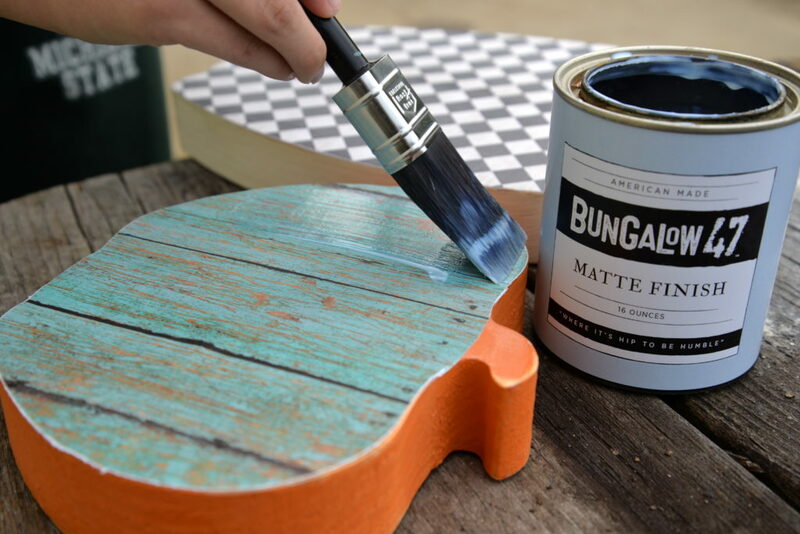 This week we decided it was time for some decoupage using our favorite medium, Bungalow 47™ Matte Finish! 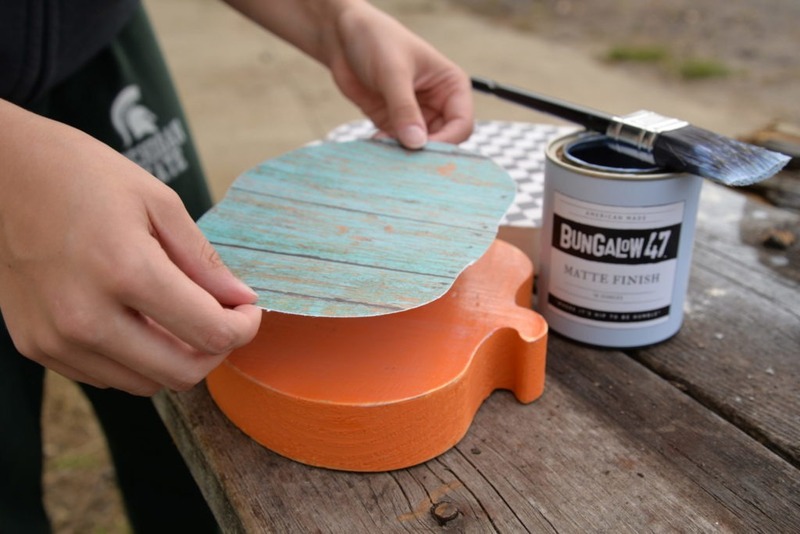 Yes, the Matte Finish is our amazing sealer for our American-made chalk and clay paint, but did you know you can also use it for decoupage? It’s so much better and easier to use than sticky white glue mediums, and since it is something everyone should have in their crafting tool box, it’s great to use it in a variety of ways. 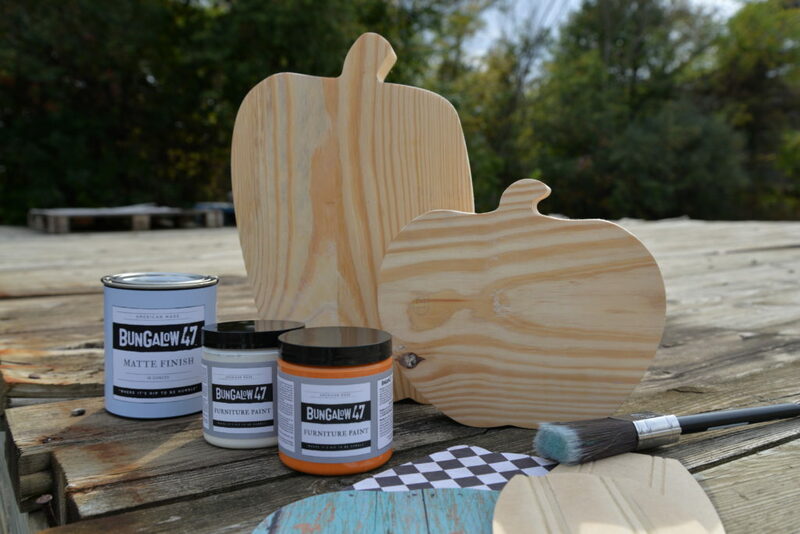 So here’s what we started with: wood pumpkin cut outs in two sizes, Bungalow 47™ Matte Finish, Bungalow 47™ Furniture Paint, scrapbook paper, and a paint brush. First, trace the shape for your scrapbook paper and cut out. You can also cut your paper close to the shape, making it larger than your wood cutout. 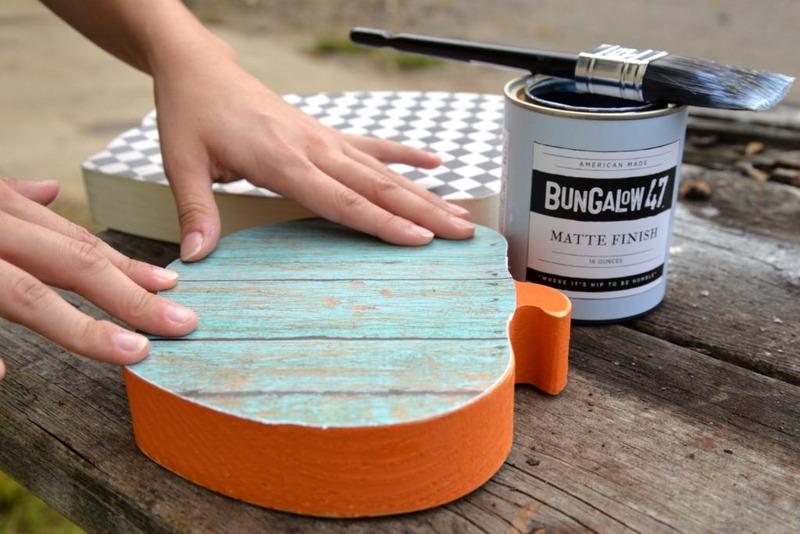 The edges can always be torn away while the decoupage is damp and/or rough sanded and overly distressed when it is dry for a slightly more rustic look. It’s good to have options. Paint your pumpkins your color of choice. We chose Terracotta Tile and Clawfoot Tub. Since everyone is always freaking out about white pumpkins, we thought we’d throw one in the mix. 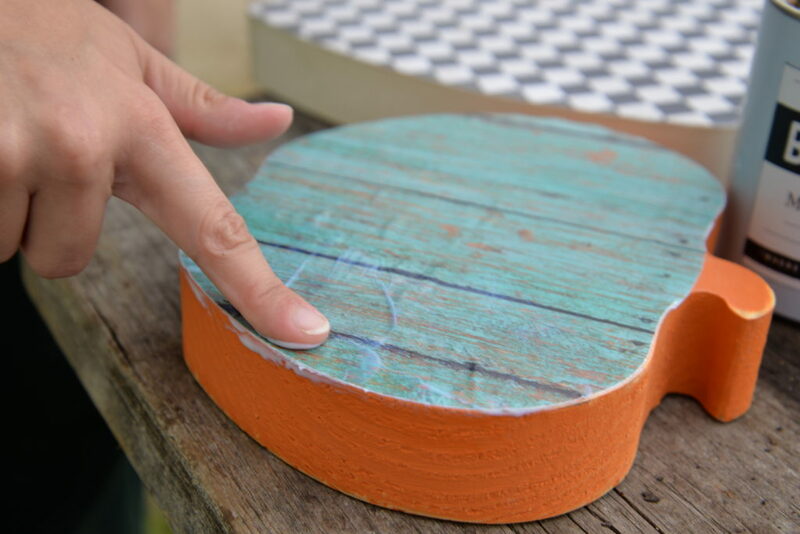 After your piece is dry, paint a coat of Matte Finish on the front of the pumpkin, or wherever you plan to decoupage. Next, lay the paper in place. Smooth out with your fingers, or lightly drag a credit card edge over the surface. Key word here is “lightly”, as you don’t want to mar your scrapbook paper design and scraping it too hard will do that. 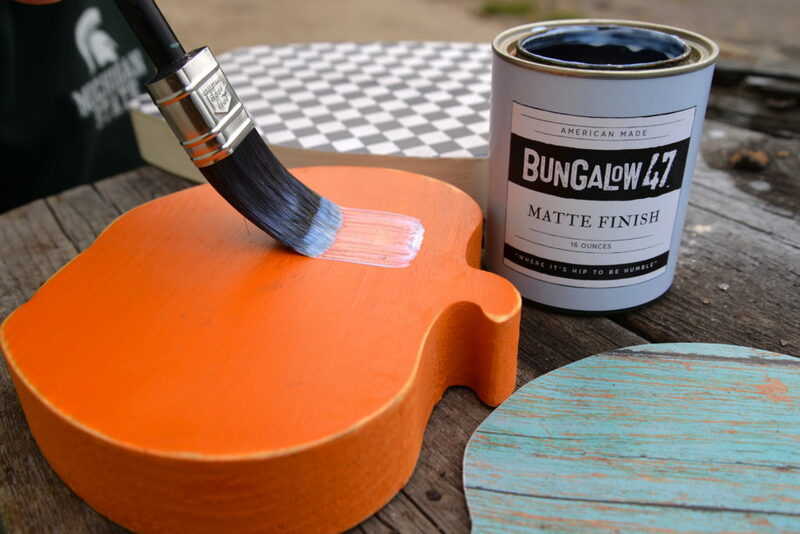 Brush on one more coat of Bungalow 47™ Matte Finish over the top. Smooth out any bubbles, and press and seal around the edges. Ta-da! Add your little finishing touches and be happy you had the chance to use up some of that scrapbook paper. We have way too much of it from a past crafting life, but you already knew we were hoarders! 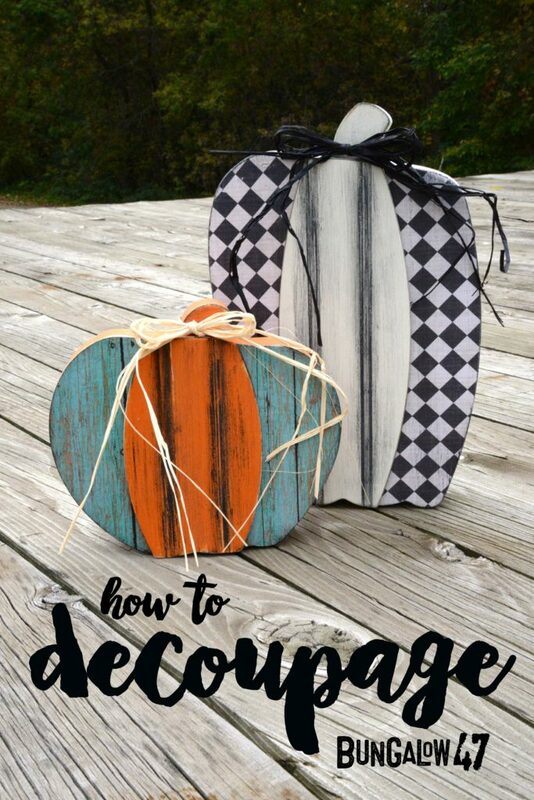 Think of all the other exciting things you can decoupage. One of our favorites was a buffet, damaged and smoke-filled, we pulled out of a super skeezy house on one of our picking adventures. 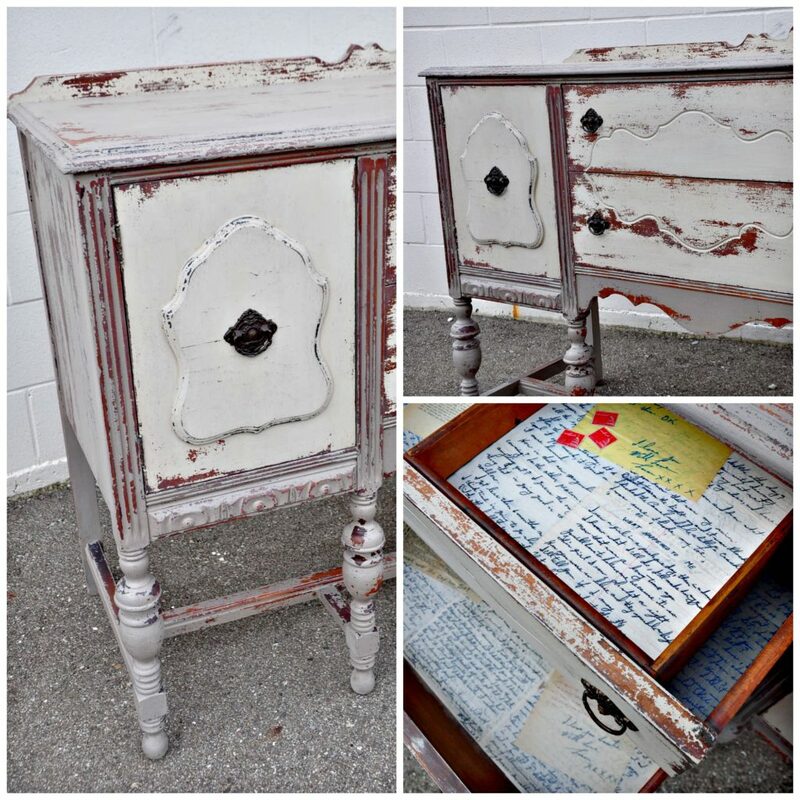 Chantelle painted it using milk paint for a peely, chippy look and then decoupaged love letters that we had found in the house, inside the drawers of the buffet and on the shelves. 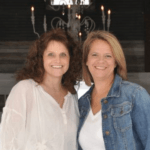 We LOVED this piece, and the sentimental story we added to the interior. Luckily, a friend ended up buying it, so occasionally we get to visit it. Feeling crafty yet? 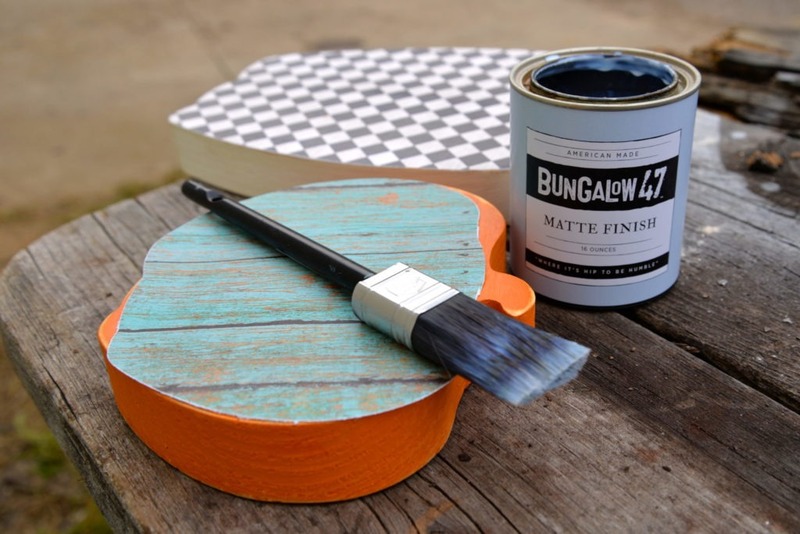 Grab some Bungalow 47™ Furniture Paint products and get going. Stay tuned for our next crafting project. 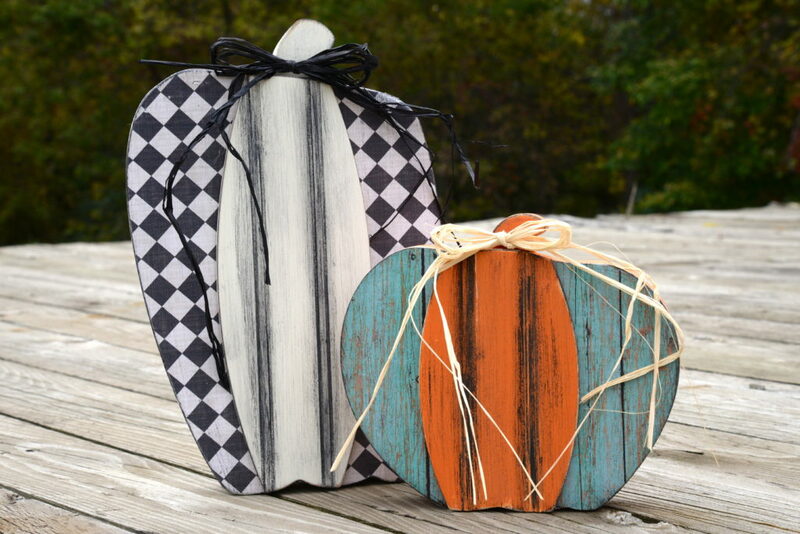 By the way, we got these cute little pumpkins from one of our Bungalow 47™ Furniture Paint retailers in Texas, who teaches amazing classes filled to the brim with crafters each week. It’s good to have friends all over, and we just love Sarah! You can check out her stuff here. I just used the Bungalow matte finish. How soon before I can start using my furniture? Melissa, The Matte Finish will be fully cured within 7 days. Depending upon your climate and it’s level of humidity, you can place items on your surface and use your furniture before that, just make sure that your surface is completely dry before using.